How far is too far? | FULL MOE PANIC!!! ← CLANNAD After Story Announced!!!!!!!!!!!! I was describing the madness that has been committed by the most certainly warp-touched people of Saitama prefecture in their latest attempt to milk the cash cow that is Lucky Star. 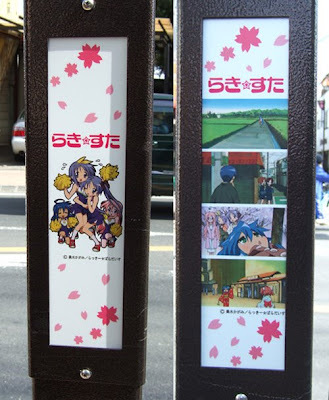 “100 of the street lamps in Satte City already have Lucky☆Star design acrylic boards mounted onto the panels. As a LS fanatic i am happy that the anime is being warmly received by the Saitama folks but certainly the should be a limit to that. Do they actually intend to turn the whole city into a Lucky Star shrine? This entry was posted in Lucky Star, Otaku, random, WTF. Bookmark the permalink. 100 Lamp post with luckystar design acrylic boards mounted onto the panels? But still nice to see that some anime not forgeten yet. hope the acrylic boards won’t get stolen. @istilllovenoe aka. shin: In before weaboo!! @rokku: actually they currently have 100 with 500+ planned. but it is indeed nice to see that the popularity of LS endures. @gordon: ill buy them off e-bay if they are stolen. if not ill have to do it myself. also, the new banner is to reflect on my current mood, which is in love with Clannad. Wow.. That is an extreme way to promote the show.. Such a waste to the taxpayer’s money..
Haha, more of a awesome moment in my opinion. A whole Lucky Star town, probably the first in history ;p.
In contrast, it’s too bad everything here is so boring.